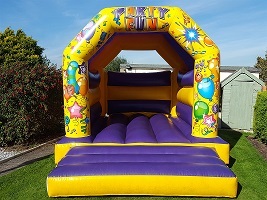 This vibrant party themed bouncy castle is suitable for children only! At 11ft x 15ft it’s reasonably big but still compact enough to fit into your garden. Please get in touch if you have any queries! Delivery and set up is free throughout Huddersfield and parts of Wakefield. Once the Balloon Fun Party Castle has been set up, we won't stay around to man the unit. We will come for collection at the end of the hire, to take away the castle. Please note, the same driver will deliver and collect each castle. Cash should be paid to the driver on delivery.